Home > Cars > Auris > Auris Hybrid – have you signed up at Toyota.co.uk? 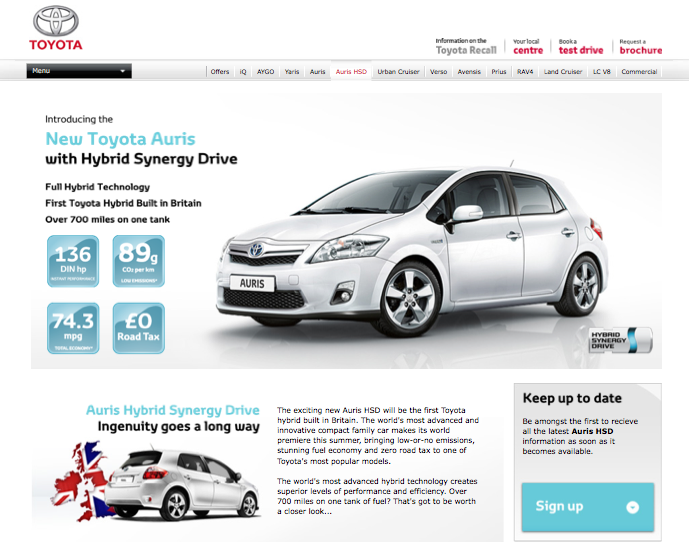 Auris Hybrid – have you signed up at Toyota.co.uk? 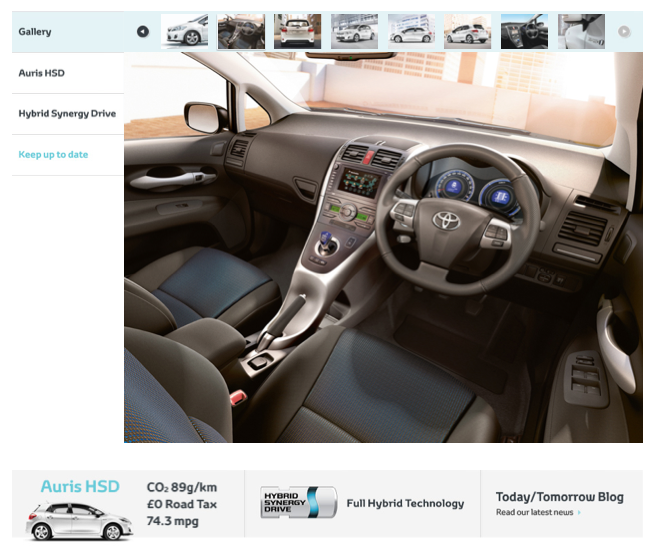 Toyota’s new hybrid star isn’t quite in Centre showrooms yet, but it’s already live on Toyota.co.uk. One click and you’ll find out the latest information about Auris Hybrid, discover more about the technology behind Hybrid Synergy Drive and have access to a brand new picture gallery. We were definitely impressed with Auris Hybrid when we saw it in Geneva, and we’re more excited than ever now that it’s coming closer to home. If you’re as eager as us, why not sign up so you can receive the latest updates from Toyota as soon as they happen? I am driving a Toyota Auris 2litr sr the performance is very good how will the Auris HSD compare I would love to change to the HSD I am asuming it is automatic like the Prius someting I am looking for in a new car. I’m very interested in upgrading from my current Yaris to the Auris HSD. Initial prices look very expensive and not much cheaper than a Prius, is it because the Auris will have a lot more extras built onto the car that would normally be paid for extra’s on the Prius. Great to hear you’re interested in the new Auris Hybrid. We’re off to the press launch in Barcelona next week. If you’d like us to ask any questions on your behalf, please click here to submit them. Remember to check back regularly next week to find out the latest information about Auris Hybrid! I can see that prices are now being listed, but can’t find details what’s included in the optional luxury pack. We’d love to tell you about extras that are available for Auris Hybrid, but full information about the car is being released at the press launch in Barcelona next week – we’ll be able to bring you all the answers you need about pricing and spec then. If you have any questions that you would like us to ask at the press launch, please submit them here. Could you tell me if the first launched include automatic gearbox or all model is automatic? All Toyota hybrids are fully automatic. The Hybrid Synergy Drive system has no gear ratios to shift between and automatically varies the engine speed to get the most efficiency available for the current demand. Some of the Lexus models offer ‘gears’ but these are simply a software emulation – and you’ll normally get better efficiency and performance by letting the car set the engine speed. Will it be free of the London Congestion Charge like the Prius? Will the leather seat option incorporate seat heating (I’ve become spoilt in my Golf and would look for the same features in an Auris HSD). I’m afraid we don’t have either of those details yet – we’ll confirm full spec and price details as soon as we have them. Thanks for getting in touch, and stay tuned. I’ve now spoken to the Brand Specialists who have confirmed that there is no seat heating option. To learn about all the options that are available – including a Bluetooth option for the T4, which I remember you mentioned previously – please check out our Auris Hybrid Q&A. Thanks. How will the price compare to the current Auris? We don’t have that information yet, but we’re hoping it’ll be released in the next couple of weeks. We’ll be sure to post all the details to this blog as soon as we receive them. Visited UK dealer yesterday, starts at about £18900! I thought you might like to know that pricing information has now been announced. For this and more, please see our Q&A. It seems to be pretty good. It’s really nice. It’s an encouraging step to introduce a Hybrid Car. I can’t wait please give us a date. As long as this car isn’t to far away in the future it could very well be my next car. We can’t wait either! Luckily, you don’t have to wait for very long: Auris Hybrid will launch on July 1st. In the meantime, keep an eye on this blog and Toyota.co.uk, and check out our Flickr gallery from Geneva – it looked great in the flesh, I can tell you!